A classic Tetris with a...self destruct button! 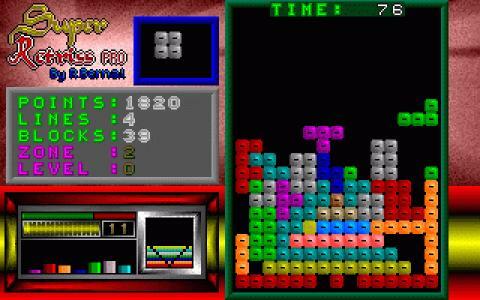 Super Retris Pro offers you just the kind of challenge that a regular Tetris game would. However, instead of levels being marked by the speed increase that accumulation of a certain number of points offered, like it was done in a regular Tetris game, in this one, a level is complete when you finally complete a specific line in the brick puzzle. You see, with this game you don't get to build from scratch, each new level comes with a certain amount of bricks already in place. Within this clutter, there is one line that has a glowing brick in it. Complete that line and see the level completed. So, you see, this is a kind of challenge based game of Tetris, for those that want a bit more to the basic vanilla game. Graphically, for my eyes, the serious nature of the game and the graphics don't really match... The colors are glowing lollipop colors, really ugly, I'd say and the left hand menu/points, lines and blocks meter looks just as ugly. But, well, the game works, though it sure could have looked a lot better had it chosen a classier color palette and had it done with the clutter and ugliness on screen. So, yeah, I'd rather play a classic Tetris game, just for a more palatable color scheme, though surely, Super Retris Pro has an interesting twist of gameplay.